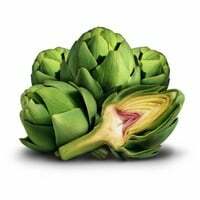 Artichokes contain phytonutrients, which have antioxidant properties that help fight against cancer, boost immunity and protect against heart disease. Good source of folate and magnesium. Look for artichokes that feel heavy and firm with a healthy green color and tightly packed leaves. Avoid artichokes with brown or soft spots, or ones with a dark brown or black stem. 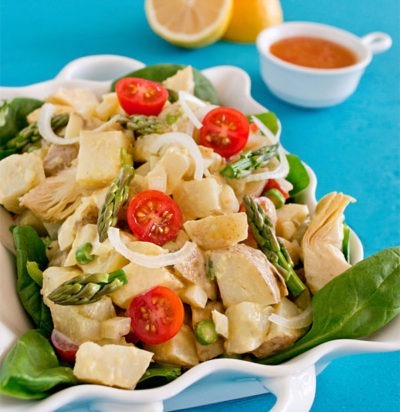 Cut off a dime-sized slice from the end of the artichoke stem, sprinkle stem with water and store in a plastic bag in the refrigerator for up to 5-7 days. Cooked artichokes should be cooled and covered before placing in the refrigerator for up to 1 week. Wash artichokes well under cold water. Use a soft vegetable brush to remove the natural, light film artichokes have. Using a sharp serrated knife, remove 1 inch from the top of the artichokes and 1/2 inch from the stem. If stuffing the artichoke, remove whole stem. Open petals slightly to allow seasoning to better coat the artichoke. Artichokes can be steamed, boiled, microwaved, grilled or baked. Technically, artichokes are flowers that have not bloomed yet. If not picked, they develop into a beautiful purple flower. 100% of artichokes in the U.S. are grown in California. One artichoke plant can produce more than 20 artichokes a year.